Research on home visiting shows that Early Head Start (EHS) programs benefit from additional training and resources that streamline philosophy and content. In this essential guide, Walsh and Mortensen propose that alignment with Family Life Education’s (FLE) strengths-based methodology results in greater consistency through a model of prevention, education, and collaboration with families. This text is the first to outline a partnership between FLE and EHS home visiting. It explores a qualitative study of FLE integrated in a current EHS program and application of FLE methodology to home visiting topics. This model will influence professional practice and provide a foundation for developing evidence-based home visiting practices. Online content accompanies the text, with videos demonstrating the FLE approach in action and discussion questions to encourage engagement with and understanding of the core material. 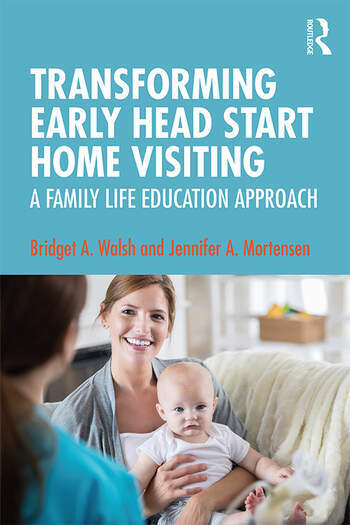 Early Head Start Home Visiting: A Family Life Education Approach is essential reading for upper-level undergraduate and masters students in family studies and early childhood education, as well as practitioners working with children and families. Bridget A. Walsh is an Associate Professor of Human Development and Family Studies at the University of Nevada, Reno. In 2016, NCFR awarded her with the honor of CFLE of the year. She is co-chair of the NCFR home visiting focus group. She is chair of the Coaching Workgroup of the Ounce of Prevention’s Community of Practice, Professional Development for home visitors. Jennifer A. Mortensen is an Assistant Professor of Human Development and Family Studies at the University of Nevada, Reno. She is a fellow with the Doris Duke Fellowship for the Promotion of Child Well-Being. She is also a CFLE and co-chair of the NCFR home visiting focus group. Her research focuses on parenting and child care for families with infants and toddlers. She draws inspiration for this work from her time as a teacher at Early Head Start.